Law 12 2018 - Mr. Goldsack Room 233 In our classroom everyone is expected to think! Please begin by recognizing and acknowledging the Semiahmoo, Matsqui, Katzie, and Kwantlen Nations on whose traditional unceded territories we live, and we learn. September 5-10. Rule of Law...what is it? Why is it important? Students do not need to complete the task attached to the notes...but be aware the task may appear as a question on a future test. September 7...in November 1820 a whaling ship was struck by a whale and sunk. the crew was set adrift, and after a few moths began eating the dead...near the end, they began drawing lots to see who would die so the others could survive...no one was charged with these "murders" because it had always been necessary for sailors to take this action when stranded at sea. 64 years later some English sailors find themselves stranded at sea off the coast of Africa...they kill and eat the cabin boy and are later charged with murder and sentenced to death. What changed? September 10...Citations (Criminal and Civil)...precedent: R. v. Dudley and Stephens (1884)...common law... please be aware there will be a quiz for citations on September 11/12 (all blocks)! September 24-28...continuing our learning about the Bill of Rights, followed by the Charter of Rights. Students should understand that rights and freedoms in Canada can be limited when reasonable to do so (Sec. 1 and Sec. 33). They are not absolute. Your rights can be limited when reasonable to do so in order to protect all of society. ​Students should be working toward completing all assignments and the first Agenda before the student Teacher begins her practicum next week! October 9...Block F watched a video (search: https://www.youtube.com/watch?v=69F7GhASOdM ) and discussed how this allegory related to the purpose of law...students attempted to discuss this in a Talking circle and realized it was difficult to respect the traditional protocol (because some of us like to talk a lot), however, at the end of the day, we came up with a great deal of interesting ideas! October 16/18...notes dealing with Democratic rights...why don't people vote? What do we need to do to entice "good people" to run for office? Should the age of eligible voters be lowered to 16? October 23/25 (Block F)....students broke into groups (The branches of government, Senate, Supreme Court, Party Whip, and Speaker of the House) and each group created a job description for one of the seven "parts" of government. Each group also formulated an argument that showed their "part" was the most important in our government...followed by some notes about the structure of government! On October 25, students were asked to think about what they know about our senate, and plan for the future...create a senator's job description based on their position for this political part of our government...options were, Reform, Abolish, maintain..
October 29...How a bill becomes law in Canada....notes posted below...AND the assignment for today! Use it for review later! November 6...Block F only...continue notes about the Charter...specifically your mobility and legal rights. Students need to know the difference between an arrest and a detention and the rights they have in each situation...the police MUST respect these rights or their case may be in jeopardy (evidence may be excluded)...Section 24 know what it is and why ...full notes for review are posted below! Remember for the test that police do not have to inform you of your right to remain silent. November 8...please complete Agenda 2B, Agenda 2A...and review for the unit test...we may start investigating the 1876 Indian Act (time permitting). November 22...students learned about the ELEMENTS of a CRIME:Actus Reus and Mens Rea The prosecution must prove that these elements were present in order to proceed and convict. Students looked at scenarios to determine the elements in each crime and shared their findings in class. 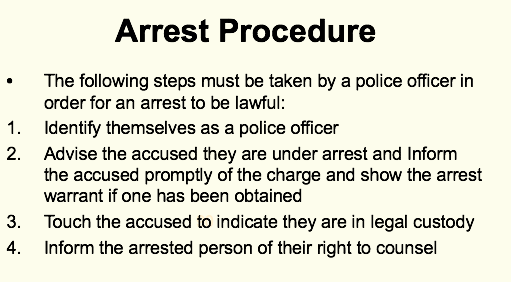 Please note that students in Block A will need to explore the Oakes case, reverse onus, burden of proof...and spend some time learning about arrest and detention (including their charter rights with respect to arrest. December 3/4...the four dimensions of a crime, General and Specific Intent Crimes...students wrote a quiz to test their knowledge about acts reps and mens Rea (with a little general and specific intent tossed into the mix). All criminal offences have two elements: (1) the intention or knowledge, and (2) action or conduct. Lawyers often refer to the intention or knowledge as the mens rea of the offence. Not all criminal offences require the offender to have the same level of awareness of their wrongful action. Offences are classified as requiring the accused to have acted with either general intent or specific intent. General Intent OffencesA general intent crime only requires that you intend to perform the act. That is, you don't need any additional intention or purpose. For example, assault is usually a general intent crime. You only need to intend your actions, not any particular result. General intent crimes are easier to prove because it is not necessary to show that you had some particular purpose. Specific Intent OffencesIf you are accused of a specific intent crime, the prosecution must prove that when you committed the crime you had intent or a purpose. in mind. The best example of a specific intent crime is theft. When you take something that you take it with the intent to deprive the owner permanently. For example, auto theft requires that you intend to deprive the owner of the car permanently. If you don't have this intent, then you cannot be convicted of theft. The basic difference between the two is that specific intent crimes require the individual who commits the crime to have a certain intent or purpose when the crime was committed, where as general intent crimes do not. 1.Summary Conviction:a less serious criminal offence, also known as misdemeanours (e.g. shoplifting). 2.Indictable:a more serious criminal offence with a severe punishment (e.g. murder – life imprisonment). 3.Hybrid:a criminal offence in which the Crown decides how to treat the charge (summary or indictable). ​Today students reviewed the acts reus and mens rea/general and specific Intent quiz and spent some time completing the Agenda 3 in preparation for the upcoming unit test. December 12...A person charged with aiding and abetting or accessory after the fact is usually not present when the crime itself is committed, but he or she has knowledge of the crime before or after the fact, and may assist in its commission through advice, actions, or financial support. Broadly speaking, "to aid under s. 21(1)(b) means to assist or help the actor... . To abet within the meaning of s. 21(1)(c) includes encouraging, instigating, promoting or procuring the crime to be committed"
An accessory after the fact to an offence is one who, knowing that a person has been a party to the offence, receives, comforts or assists that person for the purpose of enabling that person to escape. Dec. 17-21...students will write the Chapter 4 Unit Test, provided that they have completed and submitted the Agenda 3 assignment before test day. Agenda 4 does not need to be submitted prior to test day, but please understand that the information from Agent 4 will appear on the unit test. Students should begin researching for the Law Comparison project this week...the due date for the project will be in the New Year. DON'T FORGET TO INCLUDE A PROPER BIBLIOGRAPHY...look at the example at the top of this page. Jan. 14-18...police...arrest and search protocol...see the notes posted below: Remember that police do not have to inform you of your right to remain silent! Jan. 21/22...plea bargains...see the following notes. Students were asked to complete the Holmolka and Perjury tasks in class. Agenda 5B is ready for your learning pleasure! Jan. 23-25...students will wrap up the "learning" for Chapter 5 and being to review for the Unit Test (scheduled for Jan. 29/30). Check out the review notes posted below - all fair game for the test. Please note that Agenda 5 and 5B, and the Homolka Plea Bargain Task must be completed prior to the test. Jan. 29...Block A Test Day...No, the police do not have to inform you of your right to remain silent...they do need to tell you about your right to an attorney.AND...citizens can lawfully arrest people provided they do it correctly. Jan.29/30...students wrote the unit test. Students who were away MUST make arrangements to write the test outside of class. ​Feb.1...the COURT. Students should be able to explain why the adversarial system is an important part of our judicial system. Start learning about the people in the courtroom, what they do and why it's important! Would a jury convict the suspect based on the evidence presented in this video? Beware of expert witnesses! Beware of newspaper accounts! April 1-5...Criminal Defences! There will be a test pending, but students need to provide viable defences for the Fairytale assignment...Chapter 6/7 test happens April 3/4. Any student who missed the test will need to write it during flex. April 8-12...Students should be starting the Criminal Law Final (Fairytale Assignment. This project is due May 3. •In a criminal case, the Crown must prove beyond a reasonable doubtthat the accused had the actus reusand mensreato commit a crime. •In response, the accused has a basic legal right to present a defence. thereforecould not have committed the crime. 1.A statement by the accused claiming they were not present at the crime scene when the crime was committed. 2.An explanation of where they were. Various factors can influence “automatistic” behaviour, from sleepwalking, the consumption of drugs and alcohol, to a disease of the mind. •If it can be proven that an accused person suffered from a mental disorder and as a result was incapable of knowing that what he or she was doing was wrong, the accused may be declared not criminally responsible (NCR). Example:a person with paranoid schizophrenia murders someone he or she (wrongly) believes is a threat. Due to this person’s mental condition, he or she cannot truly appreciate that his or her action was wrong and can be found NCR; he or she may be referred for treatmentinstead of prison. •An accused person who uses this defence argues that he or she committed a crime while in a temporary state of impaired consciousness. •Canadian courts have recognized that a person may enter such an impaired state as the result of any of the following: a physical blow, sleepwalking, consuming drugs, a stroke, severe psychological trauma, and other physical ailments(e.g. hypoglycemia). •Example:While sleepwalking, a man murders his wife. After he wakes up, he has no recollection of doing so. Even though he was walking and blinking, he was not aware of what he was doing when he committed the murder. Definition:the accused demonstrates that he or she did not have a guilty mind at the time of the crime because he or she was intoxicated(most commonly drugs and/or alcohol). •Intoxication may be used as a partial defence. •Generally, an intoxicated person cannot form specific intent but may be found guilty of a general intent offence. •If successful, this defence can lower a conviction or reduce a criminal sentence. •Example:If an intoxicated person severely assaults someone, he or she avoids being charged with aggravated assault because he or she did not endanger the person’s life knowingly (specific intent), but the accused may still be convicted of a lesser assault charge (general intent). Definition:a person is “provoked” to lose their self-Control, and as a result commits a crime. 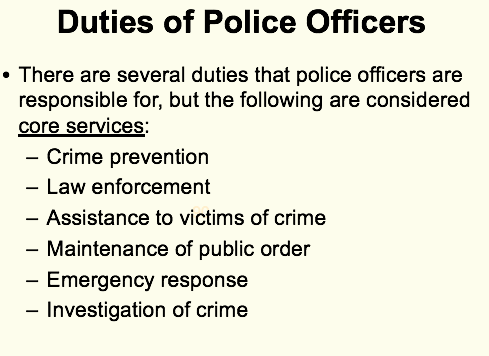 Definition: police action induces a person to commit a crime. •If a police officer coerces or forces a person to commit a crime, the officer is guilty of entrapment. •If the accused can prove the police led him or her to participate in a crime, the court can dismiss the charges immediately.Example:Jimmy is continually harassed by an undercover police officer to purchase illegal drugs. If Jimmy can convince the court that he would not have purchased drugs without the undercover officer's forceful encouragement,he can claim the officer “entrapped” him. Definition:this defence shows a lack of mensreadue to an honest mistake. •Ignorance of the law, or not knowing a particular offence was illegal, is nota valid defence. •Ignorance of the facts, or not understanding all of the details of a situation, can be used as a defence. Example:Someone receives counterfeit money as change. Unknowingly, he or she attempts to use the fake money somewhere else and is caught. The accused knows that counterfeit money is illegal, but truly did not know he or she possessed fake money. Definition:the legal use of reasonable force in order to defend yourself and your property. •TheCriminal Codeallows people to use force if they have to defend themselves, but the amount of force should not be excessive; no more than necessary. •The use or exchange of force must be reasonable.Example:A person being attacked with a weapon may use a weapon to defend him- or herself. Definition: a psychological condition caused by severe and usually prolonged domestic violence. •The Supreme Court first recognized this defence in the precedent-setting case R. v. Lavalee, 1990, as an extension of self-defence. •The main difference between battered woman syndrome (BWS) and the traditional definition of self-defenceis the issue of imminent danger. •In a typical self-defencecase, the danger is immediate. •With BWS, the danger may not be immediate but instead is constant. Definition: accused persons claim they were forced to commit a criminal act because they were in danger themselves. •Example: A man speeds to get his wife to a hospital because she is in labour. If he is pulled over by a police officer for dangerous driving, he can try to argue that he is speeding out of necessity. Definition: when someone is threatened or coerced to do something against his or her will. •Duress is similar to the necessitydefence; in both defences the accused claims to have been forced to commit a crime as the result of being in imminent danger. •The main difference is that with duressthe accused is forced to act as the result of a threat.Example:Doug shoots someone and tells Eric that he must help him dump the body. When Eric refuses, Doug points his gun at him, which compels Eric to cooperate.